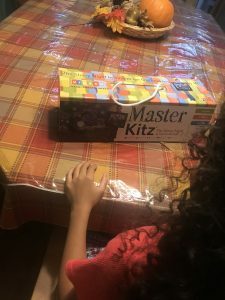 I was so excited to bless her with Kidzaw.com‘s Master Kits The Starry Night for us to do and review together! Dad was out, I sent all the other kids upstairs, and Hayven and I partook in the glorious unwrapping of our Kit together. 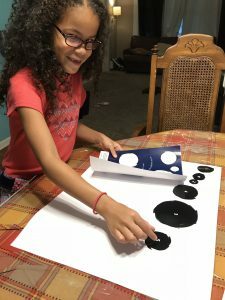 We read over the directions and took the project nice and slow, making a big mess, and some great memories. The kit comes with everything you need to complete the project except for paper towels, water and a hair dryer (optional). It comes in a nice sturdy storage box that includes 3 acrylic paint tubes, 5 oil pastels, a texturized “Van Gogh” Roller, a re-usable Starry Night stencil that is fit to the size of the art paper, a standard foam paint roller, a sheet of round “star” stickers, 2 large pieces of art paper, a kid friendly information packet all about Van Gogh, and some easy to follow directions. 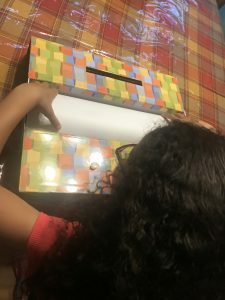 Everything is conveniently rolled up in this rectangular box so it naturally fights to hold it’s cylindar shape when removed from the container; some smoothing out and working with the paper and stencil are needed before starting the craft. In fact, Hayven and I needed to tape our pages down to keep them from rolling up. We had this same issue with the stencil. 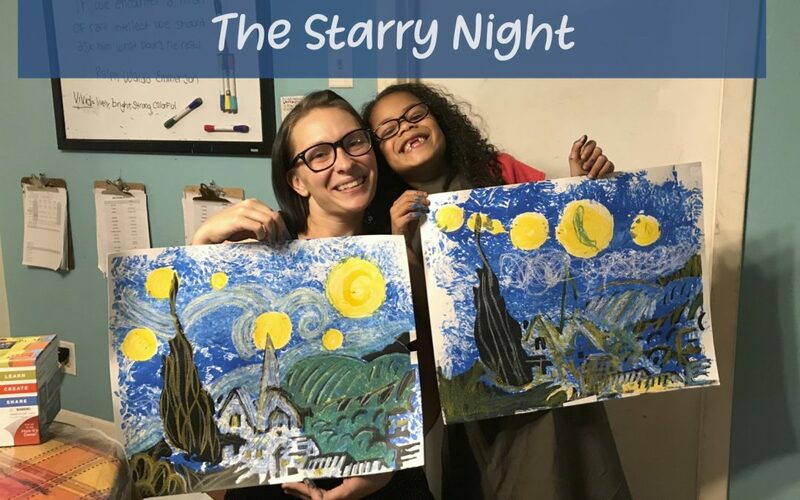 Even though we are duplicating the famous “The Starry Night” masterpiece, Hayven was encouraged to express her own artistic tendencies through this project. She placed the large black stars where she saw fit. 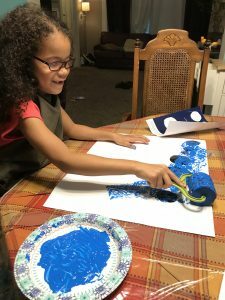 She rolled her “Van Gogh” roller all around until her paper was properly covered with the blue paint to her discretion. After removing the star stickers (which was much more difficult then I imagined – so much so I didn’t think we would get a second use out of them, but we did in fact achieve a second use), she then placed the stencil across her page and used the standard foam roller to create the city that laid below the soon to be swirling sky. As Hayven took a blow dryer to her paint job, I started on my version of this hobby! I enjoyed it just as much as she did! 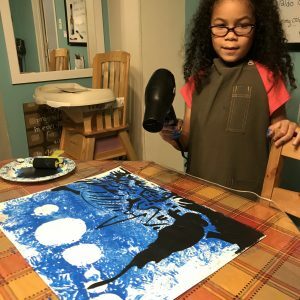 Once our artwork was completely dry we spent the next 20-30 minutes blending the oil paints in different combinations adding swirls and texture, highlights and splashes of emotion to our painting. 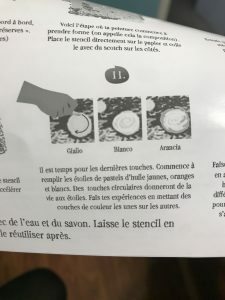 We looked at the image on the box and in the directions for inspiration. It was interesting how we could gaze upon the exact same image and interpret it so differently. Where I feel more warmth, Hayven felt more cool. Where I thought the moon’s white light would rest, she saw blue shadows. 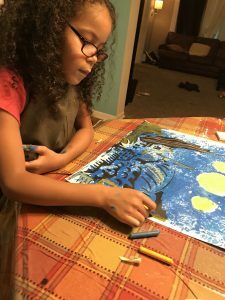 There is a deep intimacy and atmosphere of vulnerability that happens when your eyes and they eyes of your daughter are fixed on canvas’ of artwork, yet your minds, ears, and conversation are fixed on each other. I understood my Hayven in a deeper way after experiencing these couple hours with her hovered over this craft. I comprehended her thought process, studied what frustrated her, related to what made her laugh, and saw the world through her eyes for a brief moment. A moment I would never change. 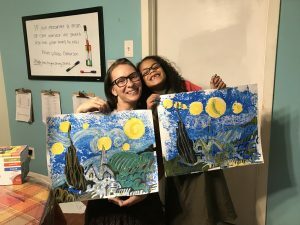 I will never look at “The Starry Night” the same again, and my Hayven will be filled with warm memories of my love for her, number 3 our of 6, when she catches glimpse this famous art work for the rest of her life! I see many possible applications of a product like this one. 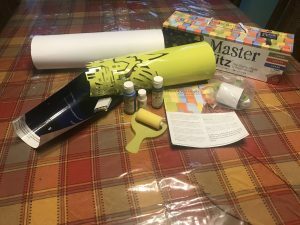 If a child were interested in, or is studying famous artists and artwork, this kit would bring an immense amount of color and application to those studies. The pamphlet detailing the person and work of van Gogh I found incredibly interesting. 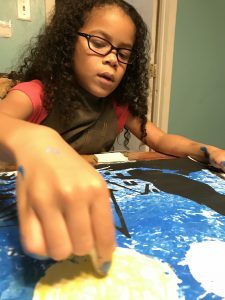 When I was a young child, I was enthralled with famous artists and could often tell you which artist created which masterpiece just based off of the technique used in the piece. I studied these things on my own, with no instruction. 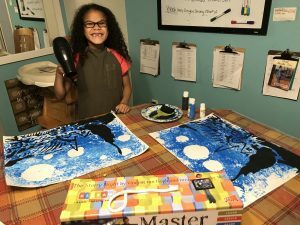 I believe that a child that is curious and interested in things like the fine arts would benefit greatly from Kidzaw.com‘s Master Kitz The Starry Night. I am 1 of 50 who reviewed this product.